Getting an air conditioner for a window that opens side-to-side is not difficult as a few are built specifically for this. 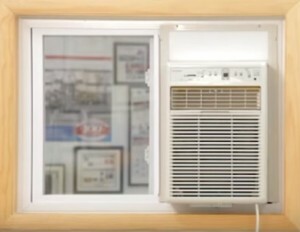 Most window air conditioners are built to fit into a wide window since these types are the most common. For this reason most window A/C units are built wide instead of vertically. Air conditioners that are built to fit into a window that slides side-to-side are caller Slider or Casement A/C units. The Frigidaire FFRS0833Q1 is an A/C unit built specifically for slider windows. It is a 8000 BTU unit and uses 115 Volt wall outlet for power. 250 Square feet of space can be cooled and it also comes with a remote control. The measurement are 23.5 x 14.5 x 20.2 inches and it weighs roughly 71 pounds. This slider window unit from Koldfront is a 8,000 BTU unit. The EER energy rating is 11 and it can cool a space up-to 350 square feet. The above are a few examples of window A/C unit that can fit into a window that slides side-to-side or a vertical window that is narrow and tall. The two main things to keep in mid when buying any window air conditioner unit is the dimensions and the power needed. Be sure to measure the window the unit will be placed in to be sure it can fit and match them to the units size. Also the correct power outlet needs to be provided or the unit can not work. While most are 115 volts some come larger A/C packages come with 220 volts which is not a common wall outlet. 220 volt units can provide more cooling capacity but will need a power line to run it. A 220 volt line can be run to a unit but will cost more money if one does not already exist. Most 220 bolt outlet in a home are setup for a electric water heater or electric clothes drier. Keep in mind there are other options to cool a room such as a Mini Split A/C unit or a portable system which are popular. Portable units and mini split units often cost more but do have their benefits over a standard window Air conditioning unit. For example a portable unit can be moved to any room and uses a hose to pump out hot air from a room. This makes them more versatile and easy to setup. A mini split unit is built to last long and fit into a home nicely by not taking up much space. They are more quite also since the main components are located away from a home.